Currently, my bedroom is a shade of pale blue – and I hate it. 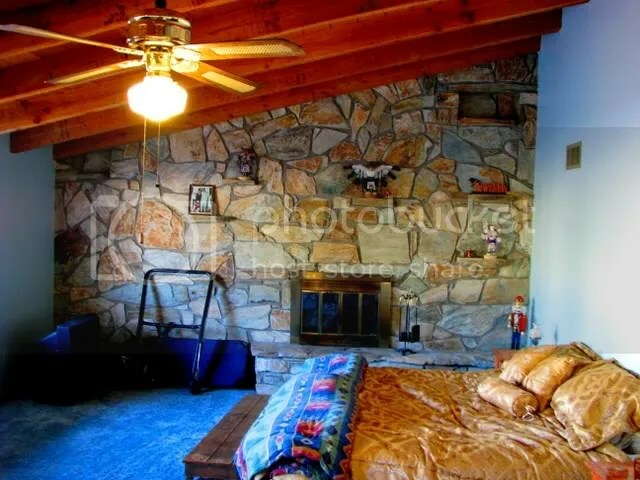 It has a lovely fireplace on one end – which features a nice rock wall (notice I said “wall” not hearth?) and that just doesn’t go with blue… Though the matching blue carpet does go with the blue walls. Meanwhile, this “before” picture doesn’t quite do justice to the blue walls, but you can sure see that big rock wall, can’t ya? And so, the plan for the weekend (photos will follow – I promise!) is to pull all the furniture away from the walls (gee, you think maybe I had that in mind when I didn’t put up much in the way of decor?) then tape and tarp and paint those darn walls a different color! There was some debate, of course, about whether I could simply paint them, or whether I’d need to prime first, and if I could use latex paint, since we aren’t sure what kind of paint is actually on the walls now… But… A few conversations with a contractor friend and I have a plan of attack! I tried a small section of plain white paint to see if it would peel or flake – and it’s good. IT all sticks, lays down nicely and doesn’t bubble, peel, flake or roll off. We’re good to go! Now, move everything to the middle of the room. Tarp the works, and lay down drop cloths. Remove all the switchplate and outlet covers, etc. and tape over the switches and outlets. Then clean walls top to bottom with TSP (yuck! ), rinse and dry. Then tape everything else – ceiling edges (you think I’m painting over that exposed-beam ceiling? Not on your life! ), door jambs, window frames, etc. Thus will be my life this weekend… Oh boy, oh joy…. I just have to keep repeating – no more blue walls, no more blue walls, no more blue walls!